Timing is everything. Collect most seeds when they are ripe and dry, but before they disperse, fall to the ground or become a meal for wildlife. Some earlier flowering species such as Wild Columbine are typically collected early in the summer instead of the fall. 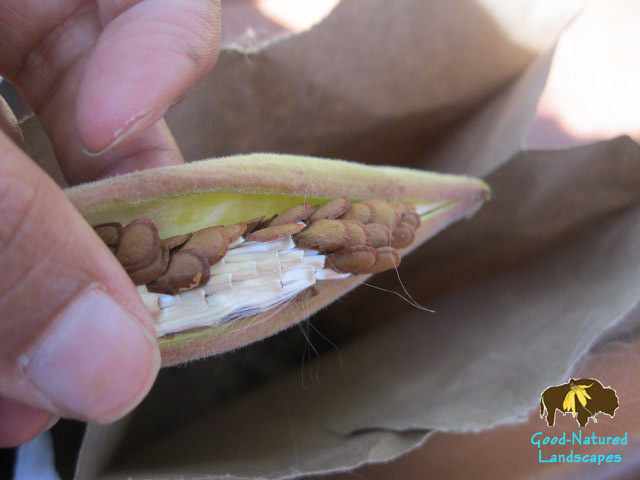 For smaller seeds like Fox-glove or Gentians, collect seeds by just shaking or twisting the seed pods so seeds fall into a paper bag or envelope. Remove other seeds by clasping your hand around the seed head, and gently pulling the seeds off, then drop the seeds into a bag. See photo above. This works well for most grasses. Sometimes it is just easier to cut the entire seed head and place the seed head into a paper bag, then waiting for the seeds to fall off inside the bag or shake the bag. Removal of the fruit or shell is necessary for some seeds such as Jack-in-the-Pulpit or Oaks. 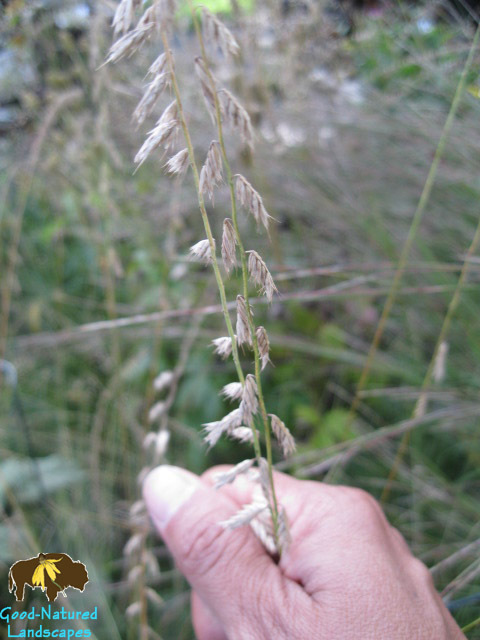 Please search the Internet for more information on collecting specific native seeds covered by fruits or shells. 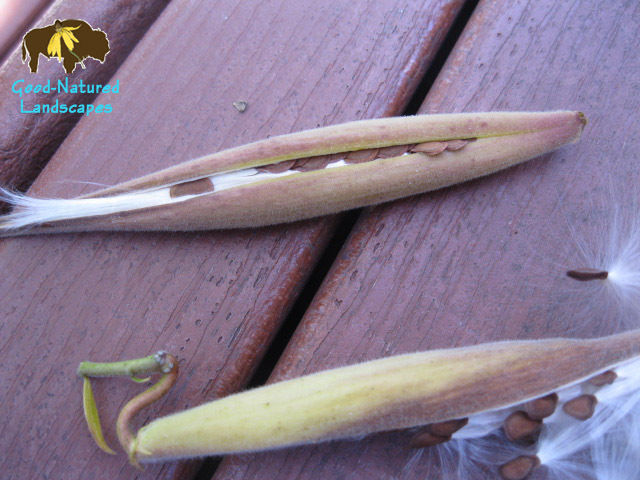 Removing seeds is easier from the Butterfly Weed pod on the left using the thumb to flick off the seeds, compared to the milkweed pod on the right. Note the reddish color of the pod means it is ripe. Flick the seeds with your nail into a paper bag. If you are sensitive to milkweed, wear gloves or wash hands immediately after handling. Remember to never collect seeds from the wild / natural areas unless you have permission!!! Doing so may reduce genetic diverstiy, populations, and damage soil and surrounding plant or wildlife in those areas. Local ecotype is important if you want to preserve local gene pools, especially important if you live near a natural area or want to protect the genes which have adapted to our local environment and wildlife. See the map to determine which ecoregion you live in and stick to seeds from those locations. Locally, we are from ecoregion 222. After collecting, store in a cool dry place, with low humidity and label all storage containers with your name, date of harvest, species collected, and origin of seed (ecoregion or county). Again you can learn more hands-on by volunteering at one the many restoration projects in our area: Restore Habitats . It’s a great way to also learn about our native flora and fauna, and meet some great people. I was fortunate to meet the late Dr. Bob Betz at a Fermi Lab seed collection project, one of great local prairie restoration pioneers. I’m sure you’ll meet other knowledgeable and wonderful prairie stewards. Please read my article It Starts with a Seed written for The Conservation Foundation Conservation@Home program to read about other interesting seed projects. EIU/INHS Prairie Plant Seeds, Seedling, and Fruits I.D.